So, are you Lichen our nature walk? Hehe… Yes, that Is funny. There's a bizzillion types of lichen in this forest here as you can see here (http://bio.research.ucsc.edu/people/goff/Lichens%20of%20the%20UCSC%20Campus/index.htm). So I'm going to describe what I see, as generally useful distinctions between catagories of lichens, instead of individual species. I'm seeing leprose lichens on the trunks of trees, it kinda looks like they've been spray painted on, and I'm seeing lots of twigs on the ground with a combination of fruiticose and foliose lichens mixed together on them. 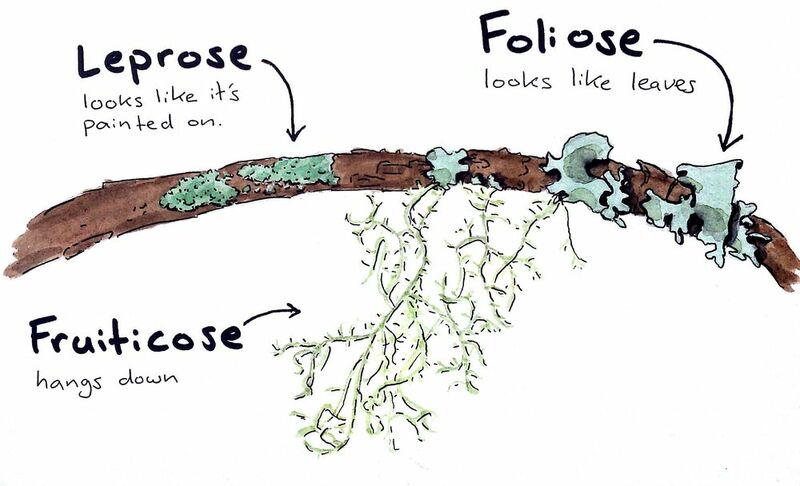 The foliose lichens are wavy lobes, that I've heard described as 'leaf-like', and the fruiticose lichens are branching and spindly growing in clumps, mostly draping down from the twigs. Can I use this graphic?